A complete guide to japanese tea, tea pots, history and ceremony. The custom of drinking tea spread from China to Japan during the 700's, when a series of diplomats from Japan visited the Chinese capital of today's Xi-An. Over the next few centuries, the diplomats returned to Japan with tea from China. 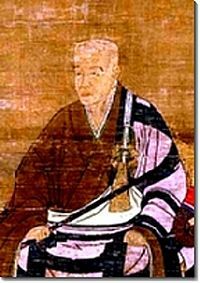 In the 12th century, Myoan Eisai, founder of the Rinsai school of Buddhism, brought back seeds and distributed them to other monks, and Japan had its own tea gardens. Since then, Japan has evolved its own unique methods of growing, processing and drinking tea. Sencha is the most commonly drunk beverage in Japan. If there is only one Japanese tea you want to explore, I highly recommend you start with sencha. Like most Japanese tea, it is fixated by steaming, then rolled into a needle shape before drying. This is different from the Chinese method of pan-firing, and it helps give sencha its distinctively intense green color and flavor. Sencha - An Enigma of Japanese Loose-Leaf Green Tea? Literally translated as "Jade Dew" for its pale green infusion, gyokuro is famous for being the most expensive of Japanese tea. Limiting the sunlight prevents theanine from converting to catechins and that results in lower astringency, more sweetness and a richer flavor. An oika aroma, similar to nori seaweed, is a unique characteristics of gyokuro. When brewed correctly, it has a complicated flavor that is intensely vegetal, mellow and sweet, all at the same time. Kabusecha is similar to gyokuro, but the shading only takes place one week prior to picking. The result is somewhere in between gyokuro and sencha in flavor. 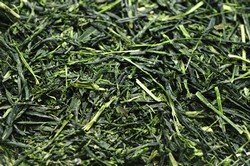 Compared to sencha, it is darker green, more full bodied and less astringent. Tencha is used mainly to make matcha - the ceremonial Japanese tea powder. Similar to gyokuro, the tencha tea plants are grown in shade. The finer tips are used to make gyokuro, while the larger leaves are used to make tencha. Generally, the tea plant may be covered longer than the standard 20 days used for gyokuro. Unlike gyokuro, the tea leaves are steamed without being rolled. After removing the stalks and veins, the tea leaves become tencha. To turn tencha into matcha, we need to find a way to powder the tea leaves into bits. Highest quality matcha is ground into a vibrant green powder using slow-turning granite grinding wheel in small batches. Friction is minimized and tea leaves are not “burned” in the process, allowing the leaves to retain chlorophyll. This method of grinding matcha has been used for centuries and is continued to this day. It is necessary to preserve matcha's unique colour, flavour and aroma profile. Hojicha is different from the other Japanese teas we have looked at so far. Rather than being steamed, hojicha is roasted to a rich brown color. This tea makes an excellent nightcap, as the caffeine levels are low. 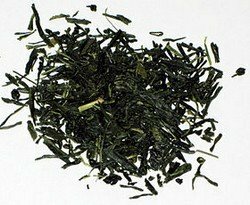 Hojicha Green Tea - A Perfect Decaffeinated Drink? The word "Genmaicha" means brown rice, rice that retains the bran covering. It is created by mixing sencha or other teas with roasted brown rice, at a ratio of approximately 50:50. Sometimes matcha powder is added. You may enjoy the savoriness of the roasted brown rice combined with the refreshing green of sencha. Since sencha has already been diluted by rice, the caffeine content is low. It is said this tea is suitable for children and the elderly. How to buy the best Japanese green tea. We get you started with five online tea shops. 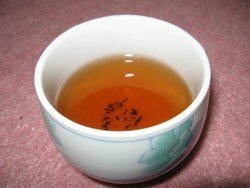 Kukicha and Hojicha - Low In Caffeine and Health Benefits? What you need to know before you start shopping for Japanese tea sets. The tetsubin is a cast-iron tea pot first used by the Japanese. In this article, I review two products - one by Old Dutch, the other by Teavana. Japanese tea cups are known as yunomi chawan or simply yunomi. They are for drinking loose-leaf teas such as sencha or gyokuro. They come in three varieties: Chagama, Tetsubin and Electric. Which one is right for you? There are two types of Japanese trays, with each designed for chanoyu and everyday use.